You may have read that upgrades via the Nokia/Ovi store are no longer possible. For users of the Lite version of QuasarMX: Just uninstall the old version and download and install the free version. For owners of the Full version of QuasarMX (now Pro) this unfortunately means that upgrading is a bit more involving because we do not have any record of who has bought the full version from Nokia. For a proof of ownership the new version of QuasarMX will scan your device for an older installed full version of QuasarMX. Start the free version of QuasarMX (notice the new icon). 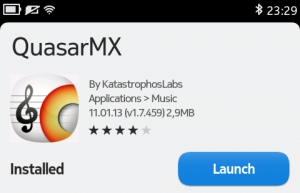 The app will tell you that it has found an installed version of QuasarMX Full on your device. Please follow the instructions on the screen to create an account or login with an existing account. The license will be transferred to your account. Once this is done, you may either unlock the Pro features immediately in the app or download and install the package of the Pro version. IMPORTANT: Please make sure to uninstall the old QuasarMX Full version that you downloaded from the Nokia store before installing the new Pro version package, otherwise the installation will fail. You may now uninstall the old version of QuasarMX. If you previously skipped the upgrade check, you can easily start the upgrade again via Main Menu > Help & About > Unlock Pro features. If you are experiencing problems with the upgrade process, please contact us at support@meteorasoftworks.com.